If you have detected FoxTab Audio Converter on your system, you should carefully think whether you want to keep it there because this program is not the most reliable one. According to the specialists of pcthreat.com, FoxTab Audio Converter can be classified as a potentially unwanted application because it might enter the system without user’s permission, it might start together with Windows, and it is difficult to delete it. Of course, it is your choice whether to keep FoxTab Audio Converter on the system; however, we believe that you should get rid of FoxTab Audio Converter and find a more reliable application. As it is not very easy to delete this program, you should definitely continue reading this article. The publishers of FoxTab Audio Converter claim that this program is the best solution for all audio conversion needs. The program itself can convert music to various audio files, including .mp2, .mp3, aac, .au, .ogg, .ape, and others. On top of that, it is completely free and it is very easy to use it. FoxTab Audio Converter itself works on Windows 7, Windows XP, and Windows Vista; thus, it is aimed at a wide range of computer users. If it has appeared on your system out of nowhere, we do not recommend keeping it installed because it might be modified by cyber criminals. If you cannot remember downloading and installing FoxTab Audio Converter yourself, there is a huge possibility that it has entered the system without your permission. As the researchers of pcthreat.com have found out, FoxTab Audio Converter might travel bundled with other applications. Thus, there is a huge possibility that there are other undesirable programs on your system as well. It is important to delete them together with FoxTab Audio Converter because they might act in an undesirable way, for instance, flood your screen with commercial advertisements as well. The removal of FoxTab Audio Converter is not very easy because the program itself cannot be removed via Control Panel. If you check the Control Panel, you will see that there is only an entry that will help you to stop automatic updates for FoxTab Audio Converter only. As you have probably understood, the only way to get rid of FoxTab Audio Converter is to scan the system with an automatic tool, for instance, SpyHunter. Click on the Download button below the article and you will be able to download its diagnostic version. 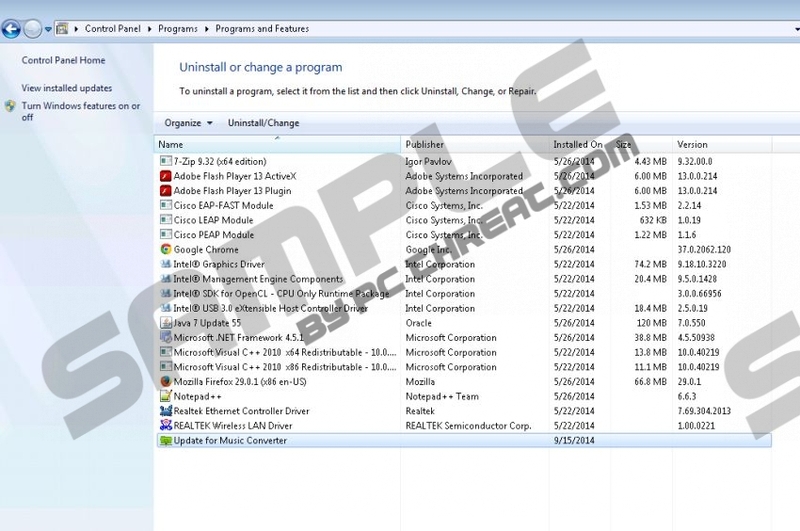 Click on the software that you are planning to remove. Quick & tested solution for FoxTab Audio Converter removal.